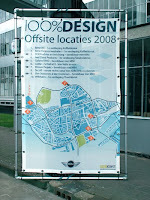 Now in the corridors going to hal3 are some projects displayed of the Fine art Academy of Maastricht. 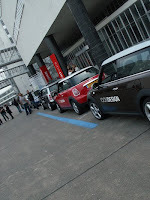 This looked very cool but not sure what happened tot the 2nd A in Maastricht. Left is a very cool collection of different plate with cool design behind it. 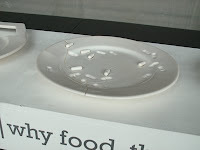 One of them is this a plate withe pill and also see dents in the plate made by the pills. Right there is a chair made out of manyy layers of paper. Really not sure if it would hold thoug but for sure it looks very artistic. This is a very cool chair not sure if it is possible to sit on it though but surely looks like a very special design. 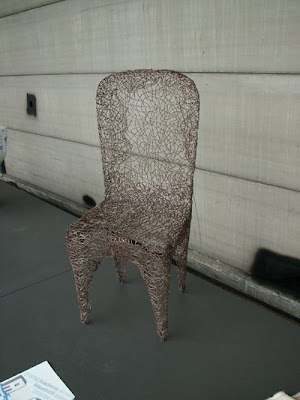 It made of metal wire are meshed to this chair shape, and looks like a very tedious job to make a chair like that. Now we are of going to hal3 where its was the darkest hall of all. This is a very cool stand it got kind of layers looks and the thing that attracted me the most is that lamp with the hovering logo on next to it. 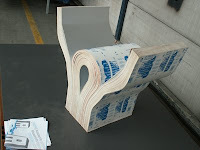 This stand have very radical design and also a chair made out of carbon fibre. Too bad it's too dark to make a good picture of the carbon fibre chair, you can barely see it just on the left top. 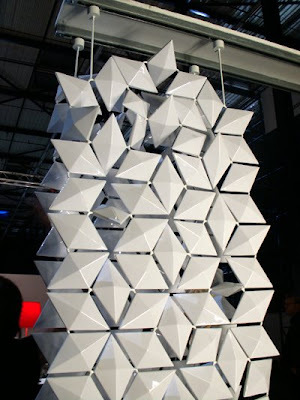 These are special curtains which you could rotate any of the diamond shapes to let more light through. A very cool looking concept but looks very heavy and also very tedious job to rotate every one to get more light through and then rotate them back. 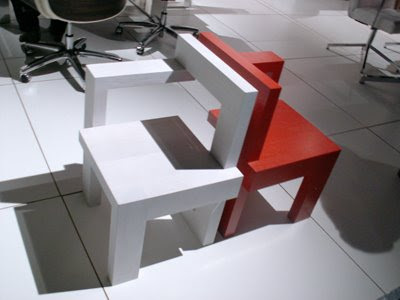 These two chair looks very unlogically made but looks very odd from differnt side but very cool. 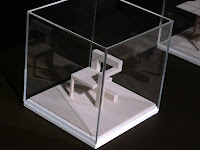 Below is minature model of these chairs. Here are two small miniatures of which they had placed on the stand. There were actually more but these were the few ones which I could take a good picture because of the lighting and the others were black or had too much light reflection with a flash. 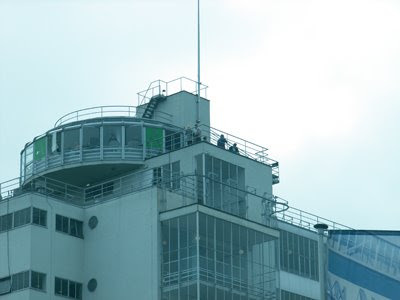 Here is a view of on the top of the building on the special place. 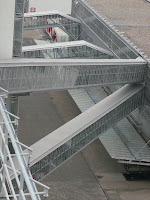 It was the tea house and made picture of those special stairways from one building to the other. 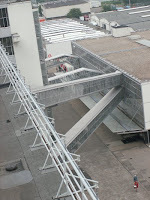 Here is a view of the top from outside, you could reach the top by a very cramp elevator or walk all the stairs. I choose for walking because there were allot of people waiting for the elevator. When I walked back down I met the girl with the tiles dress again, actually I should had followed her so I could interview her for an article for a school project. Here us a map with offsite locations however I didn't went to those places because I arrived fairly late and did not knew there were offsite your could had gone to with those mini Coopers. 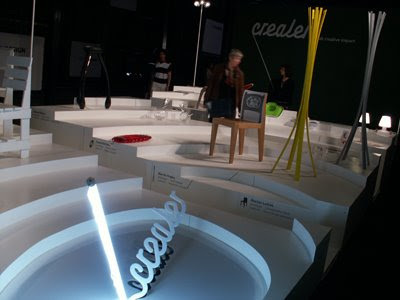 However still it was a good event to see possibilities in furnitures and inspire a bit with innovative and fresh designs. And this was it about 100%Design and will be talking about Graphic Design Festival Breda next and really met allot of top designers including Ji Lee of the Bubble project. Also me helping kids making signs for in Breda self use use of vinyl sticker sheets a plastic sign.